The Basic Reading Inventory (BRI) is administered to all students in grades 2-12 throughout the year. All students are tested in the fall and spring with some students being tested in winter. These results are analyzed by the Building Leadership Team and trendlines of progress are created to assess student achievement toward reading comprehension, fluency (rate of reading), and accuracy (pronunciation). The Iowa Assessments have replaced the Iowa Basic Tests which were called ITBS and ITED. The Armed Forces Vocational Aptitude Battery is a series of tests developed by the Department of Defense in the 1960s. Until recently, the battery consists of 10 individual tests of the following subjects: Word Knowledge, Paragraph Comprehension, Arithmetic Reasoning, Mathematics Knowledge, General Science, Auto & Shop Information, Mechanical Comprehension, Electronics Information, Numerical Operations, and Coding Speed. In December 2002, DOD eliminated Numerical Operations and Coding Speed from the ASVAB, and added a new section titled "Assembling Objects." There are currently three versions of the ASVAB. Results from any one of them can be used for military recruiting purposes. High School Version. The "High School Version" is officially called "Form 18/19." It's a paper-based ASVAB commonly given to juniors and seniors in high school through a cooperative program between the Department of Defense and the Department of Education. The test is offered at more than 13,000 high schools and post secondary schools in the United States. The primary purpose of this test is not for enlistment in the military (although the test scores can be used for military enlistment). The primary purpose of this test is to help school counselors and students discover where a student's basic aptitude lies. Approximately 900,000 students take Form 18/19 ASVAB each year. Paper ASVAB for Recruiting. The paper version of the ASVAB used for military recruiting is officially known as "Forms 20-22." This version is given by the Armed Forces for enlistment purposes only. While the questions on the high school version and the recruiting version are different, they are equal in difficulty. Few people take the paper recruiting version of the ASVAB these days because most folks interested in joining the military take the computerized version of the ASVAB at the Military Entrance Processing Station (MEPS). CAT-ASVAB. The third version of the test is the CAT-ASVAB, which is a computerized version of the Forms 20-22 ASVAB. As each question is answered on the computer screen, the computer automatically selects the next question. Most people find that they score better on the CAT-ASVAB than they do on the paper-versions. This is because, for overall ASVAB score calculation (not individual line scores), the mathematics knowledge (MK) and arithmetic reasoning (AR) questions on the ASVAB are "weighted," with harder questions worth more points than easier questions. On the CAT-ASVAB, when one gets an answer right, the computer automatically selects a more difficult question (worth more points). If one gets a question wrong, the computer selects an easier question for the next question. The ASVAB is not an IQ test. It does not measure intelligence. The battery of tests were designed specifically to measure an individual's aptitude to be trained in specific jobs. The Army began general testing of draftees during World War I. In order to provide a means of classifying draftees, the Army developed the Army Alpha Test, which consisted of 212 multiple-choice and true/false questions on the following subjects: vocabulary, sentence structure, arithmetic problems, number series, general knowledge, and "common sense." When it became apparent that many draftees could not read or write, and therefore could not be properly classified using the Army Alpha Test, the army developed the Army Beta Test, which minimized verbal knowledge and used only pictures and diagrams. During World War II, the Army replaced the Alpha & Beta Tests with the Army General Classification Test. This test consisted of 150 questions on the following topics: vocabulary, arithmetic problems, and block counting. More than 9 million recruits took this test during World War II. Interestingly, the tests showed that only 63 percent could read/write above a third grade level. During this time, a completely separate "aptitude test" was being administered by the Navy (The Air Force was still part of the Army). When Congress passed the Selective Service Act in 1948, they mandated that the Department of Defense develop a uniform screening test to be used by all of the services. In response, DOD developed the Armed Forces Qualification Test (AFQT). The test consisted of 100 multiple-choice questions in the following subjects: vocabulary, arithmetic, spatial relations, and mechanical ability. This test was given to recruits from 1950 to the mid 1970s. The separate tests were used to form a composite AFQT score, and each service was allowed to set their own minimum score standards. In the 1960s, DOD decided to develop a standardized military selection & classification test, and administer it throughout U.S. High schools. ASVAB tests were first used in high schools in 1968, but it wasn't used for military recruiting until a few years later. In 1973, the draft was ended and the nation entered the contemporary period in which all military recruits are volunteers. Three years later, in 1976, the Armed Services Vocational Aptitude Battery (ASVAB) was introduced as the official mental testing battery used by all services. In December, 2002, DOD removed two sub-tests from the ASVAB, and included one new test. Removed were Numerical Operations and Coding Speed. Added was a new test called "Assembling Objects." There is no overall "ASVAB Score." When you hear someone saying "I got an 80 on my ASVAB," they are talking about their AFQT (Armed Forces Qualifying Test) score, not an "overall" ASVAB Score. The first step is to determine your Verbal Expression (VE) Score. This is done by adding the value of your ASVAB Word Knowledge (WK) Score to the values of your Paragraph Comprehension (PC) Score. This result is then compared to a chart which gives you your scaled VE Score. The formula to derive the AFQT "raw Score" is 2VE + AR (Arithmetic Reasoning) + MK (Mathematics Knowledge). It's important to understand here that the AFQT score is not computed with the AR "Line Score" and the MK "Line Score" that you see on your ASVAB scores sheet. The AR and MK scores shown on the score sheet is "number correct." However, the score used to compute AFQT score is the "weighted score," which takes into consideration the difficulty level of the question. This formula results in the AFQT "raw score," which is then converted into a percentile score. In 1980, a study, known as the "Profile of American Youth," was conducted by the Department of Defense in cooperation with the Department of Labor. DOD administered the ASVAB to a total of 11,914 individuals, ranging in age from 16 to 23, from July to October 1980. The purpose of the Profile of American Youth was to obtain data on the vocational aptitudes of current youth and to establish current national norms for the ASVAB. The person's AFQT score is a percentile score, based on the population of test-takers in the above study. The percentiles are based upon a 99 point scale with 99 being the highest. So, if an individual has an AFQT score of 50, then his/her AFQT "raw score" is better than 50 percent of the individuals who took the test in the above mentioned study. In the early 90s, Congress passed a law stating that no Category V recruits could be accepted for enlistment in any of the military services, and no more than 20 percent of accessions could be in Category IV. Additionally, Congress required that any Category IV accessions had to be high school diploma graduates (no GEDs). However, the military services have even stricter standards for enlistment. See our ASVAB Minimum Score Chart for minimum AFQT scores required to join each of the military services. The last time ASVAB percentile scores were developed was in 1980. That means, folks taking the ASVAB today have their percentile scores computed based on the group who took the test 24 years ago. However, effective July 1, 2004, DoD has "re-normed" the ASVAB, which results in different overall scores for those taking the ASVAB after July 1. For details, see our article, The ASVAB has Just Gotten a Little Harder. General Science (GS) - 25 questions with an 11 minute time-limit. Arithmetic Reasoning (AR) - 30 questions with a 36 minute time-limit. Word Knowledge (WK) - 35 questions with an 11 minute time-limit. Paragraph Comprehension (PC) - 15 questions with a 13 minute time-limit. Auto & Shop (AS) - 25 questions with an 11 minute time-limit. Mathematics Knowledge (MK) - 25 questions with a 24 minute time-limit. Mechanical Comprehension (MC) - 25 questions with a 19 minute time-limit. Electronics Information (EI) - 20 questions with a 9 minute time-limit. Assembling Objects (AS) - 16 questions with a 9 minute time-limit. See our ASVAB Sample Questions page for samples of questions you'll find on each area of the ASVAB. Recruiters now have access to a special computer program that gives a mini-ASVAB test in their office. This computerized test only asks questions in the four ASVAB sub-test areas which are used to determine the overall ASVAB Score (AFQT Score). Most people find that this "mini-test" gives a pretty good indication of how well they will score on the actual ASVAB Test. The ASVAB test isn't designed to be difficult. In fact, most of the sub-tests ask questions that are on a high-school level. It is possible to study to increase your ASVAB scores. The ASVAB scores are determined from your current knowledge in the nine sub-test areas. You can increase your score by increasing your knowledge, i.e., going to the library and studying high school level text books in those particular areas. 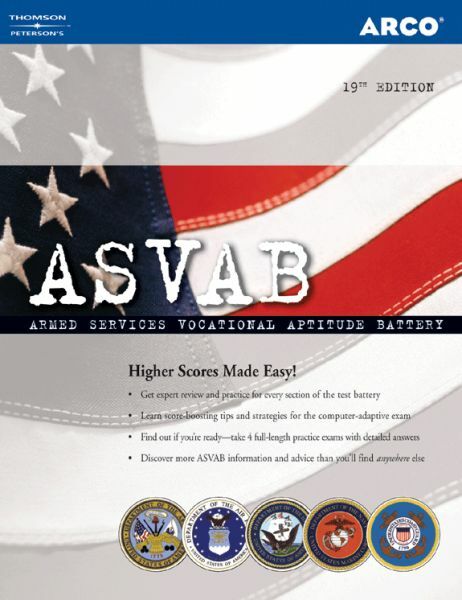 There are several ASVAB Study Guides available on the market, including my own book, ASVAB for Dummies. A word of caution about ASVAB Study Guides. They are great tools to use to give yourself "self-tests" to determine which subject areas you should study up on. However, I've seen too many people waste time and money by purchasing an ASVAB Study Guide, then spend hours trying to memorize the questions and answers in the Study Guide. The ASVAB test is highly-controlled. I can guarantee you that no author of an ASVAB Study Guide has access to the actual questions asked on the ASVAB. At most, the ASVAB Study Guide can show you similar questions. The proper way to use any ASVAB Study Guide is to use the practice tests included to "self-test," to determine which areas of the ASVAB you need to study more. Then, use other resources (such as high school or college text books) to study up on the subject. Another hint -- remember, only four areas of the ASVAB are used to compute the overall ASVAB Score. If your concern is scoring high enough to qualify for the service of your choice, you should concentrate your study areas on those areas. Also, don't waste too much time studying areas of the ASVAB that are used for job qualification for jobs you have no interest in. For example, if you're not interested in a maintenance job, don't waste too much time studying up on Auto & Shop information. ASVAB results are valid for two years. After taking an initial ASVAB Test (any ASVAB test taken in school doesn't count as an "initial test"), one can retake the ASVAB after 30 days. After the re-test, one must wait at least six months before they can take the test again. The military services use the latest ASVAB scores, not the highest, for service and job qualifications. (Note: In extreme circumstances, such as suspected test-compromise, the MEPS commander can direct a re-test before the 30 day/six month window). While each of the services have their own policies governing when or if a retest will be given, in general a retest is not allowed for the mere purpose of improving your scores (unless the overall score is below the minimum acceptable by that service). In the Army and Air Force, if one scores high enough to qualify, then one is only allowed to retest if something unusual happened during the test, and there is substantial evidence to show that the score(s) do not reflect the applicant's true potential. An example would be a high school honor student who accidentally mis-marked the answer sheet, resulting in an extremely low score. The fact that the individual is an honor student would be evidence that the low score is below their actual potential. There is a positive reason for the retest, such as to qualify for a specific job program. The Marine Corps allows re-tests only under specific conditions. Per MCO P1100-72B (Marine Enlisted Recruiting), Part F, Paragraph 2c(3), the Corps will allow a re-test one month after the initial test, and six months after the second test, if evidence shows that due to the applicant's education, experience, and maturity, the acheived score is significantly below the applicant's capabilities. Re-testing cannot be done for the sole purpose of increasing scores to qualify for certain enlistment options. There must be clear evidence that the test scores are below the applicant's potential (reference MCO P1100-72B, table 3-7, note #2). The AFQT score is used solely to determine whether or not a person is eligible to join a particular branch of the military. The AFQT score is not used to determine whether or not someone is qualified to be trained in a specific military job. Military job qualification is determined based on "Composite Scores," which are made up of individual ASVAB sub-test scores. Mechanical Aptitude Score - Determined from General Science (GS), Mechanical Comprehension (MC), and Auto/Shop (AS). Administrative Aptitude Score - Numerical Operations (NO), Coding Speed (CS), and Verbal Expression (VE). (Note: With the elimination of NO and CS from the ASVAB, a "dummy score" is now inserted there, so the Administrative Score is actually determined directly from the VE Score). General Aptitude Score - Determined from Arithmetic Reasoning (AR) and and Verbal Expression (VE). Electronics Aptitude Score - Determined from General Science (GS), Arithmetic Reasoning (AR), Mathematics Knowledge (MK), and Electronics Information (EI). See our Air Force Enlisted Job Description & Qualifications pages to see what composite scores are required for each Air Force enlisted AFSC (job). Clerical (CL) - Determined from Verbal Expression (VE), Arithmetic Reasoning (AR), and Mathematics Knowledge (MK). Combat (CO) - Determined from Verbal Expression (VE), Coding Speed (CS), Auto & Shop (AS) and Mechanical Comprehension (MC). Note: Because CS has been removed from the ASVAB, a "dummy score" is inserted for this area. Electronics (EL) - Determined from General Science (GS), Arithmetic Reasoning (AR), Mathematics Knowledge (MK) and Electronic Information (EI). Field Artillery (FA) - Determined from Arithmetic Reasoning (AR), Coding Speed (CS), Mathematics Knowledge (MK) and Mechanical Comprehension (MC). Note: Because CS has been removed from the ASVAB, a "dummy score" is inserted for this area. General Maintenance (GM) - Determined from General Science (GS), Auto & Shop (AS), Mathematics Knowledge (MK) and Electronics Information (EI). General Technical (GT) - Determined from Verbal Expression (VE) and Arithmetic Reasoning (AR). Mechanical Maintenance (MM) - Determined from Numerical Operations (NO), Auto & Shop (AS), Mechanical Comprehension (MC) and Electronic Information (EI). Note: Because NO has been removed from the ASVAB, a "dummy score" is inserted for this area. Operators and Food (OF) - Determined from Verbal Expression (VE), Numerical Operations (NO), Auto & Shop (AS) and Mechanical Comprehension (MC). Note: Because NO has been removed from the ASVAB, a "dummy score" is inserted for this area. Surveillance and Communications (SC) - Determined from Verbal Expression (VE), Arithmetic Reasoning (AR), Auto & Shop (AS) and Mechanical Comprehension (MC). Skilled Technical (ST) - Determined from General Science (GS), Verbal Expression (VE), Mechanical Comprehension (MC) and Mathematics Knowledge (MK). See our Army Enlisted Job Description & Qualifications pages to see what composite scores are required for specific Army MOS's (jobs). Clerical (CL)- No Marine Corps enlisted job uses this composite anymore. In 2002, all enlisted MOS's which had a requirement for a CL composite score were converted to GT scores. Electronics Repair, Missile Repair, Electronics & Communications (EL) - Determined from General Science (GS), Arithmetic Reasoning (AR), Mathematics Knowledge (MK) and Electronic Information (EI). General Maintenance, Construction, Utility and Chemical Maintenance (MM) - Determined from General Science (GS), Auto & Shop (AS), Mathematics Knowledge (MK) and Electronics Information (EI). General Technical, Special and Officer Programs (GT) - Determined from Verbal Expression (VE) and Arithmetic Reasoning (AR). See our Marine Corps Enlisted Job Description & Qualifications pages to see what composite scores are required for specific Marine Corps MOS's (jobs). Navy & Coast Guard. The Navy and the Coast Guard use direct ASVAB line scores for job qualification determination. See our Navy Enlisted Job Description & Qualification pages and our Coast Guard Enlisted Job Description & Qualification pages for ASVAB line score requirements for specific Navy and Coast Guard ratings (jobs). ©2009 About.com, Inc., a part of The New York Times Company. All rights reserved.